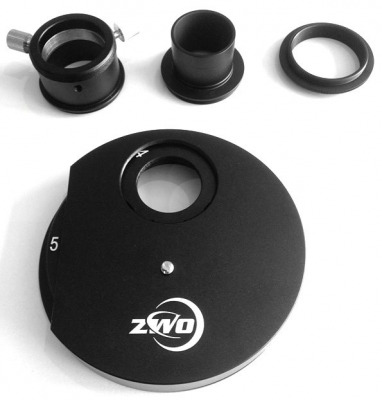 ZWO came up with this high quality 5-position filter wheel, but in addition to visual use, the main features of this filter wheel suggest that it has been designed mainly for astro photography. 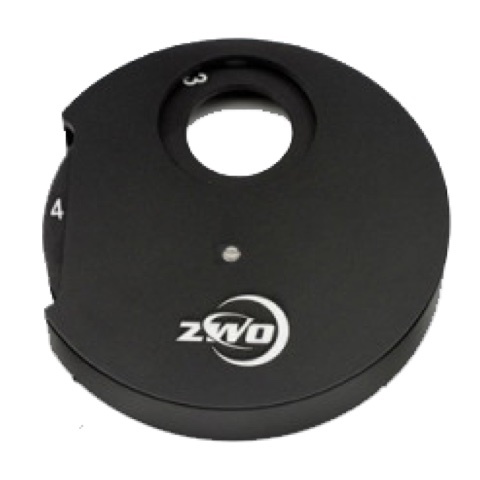 Up to five filters can be installed in the numbered compartments that feature standard 1.25" filter thread, and each can be selected for your eyepiece or camera by simply rotating the inner wheel to any of the five click-stop positions. Unlike in the case of many competing products, it is very easy to turn the wheel that helps to keep your object intact. It is not a problem with motorised filter wheels, but if it's difficult to turn a manual filter wheel, it is possible to knock the telescope off of position... so it's better to have a filter wheel that turns smoothly. The filter wheel can be attached to your focuser either by the supplied 1.25" nosepiece adaptor or via a T-thread. There is actually a female T-thread on both sides of the filter wheel. The robustly constructed filter wheel is supplied with a 1.25" nosepiece and a 1.25" eyepiece holder with brass compression ring. A T-2 inverter (mainly for attaching it to Newtonian telescopes) is also available on request. Please note: your focuser will require 19mm of inward focusing distance from the normal focus position to compensate for the thickness of the filter wheel. Five-Position, 1.25" filter carousel with a numbered äóìclick" at every position to make the task a breeze. The filter wheel is only 19 mm thick and weight 200 g, allowing it to be used on almost any telescope. Suitable for 1.25" filters with maximum height below 7 mm (without screw).